It's been said a million times before, but honestly, it is the people at First Security Bank that is key to having them as a valuable business partner. We deal with the staff on a daily basis with our auto, home, flood, commercial insurance, and our personal banking. They help our business succeed. We appreciate working with the same loan officer and staff every year. Long term relationships are very important in our business. First Security and Dumont Telephone Company share the same philosophy about how important the rural areas of Iowa are. First Security’s confidence in us provided the opportunity to extend fiber optic cable to every home and business (both town and rural) in the service areas of Dumont and Allison. They are a key component to us evolving from the original 1902 traditional landline telephone company, to a broadband company operating a state of the art network to provide voice, video, and data services which connects all customers to a world of endless opportunities. Our bank in Riceville loaned us the money for feeder cattle when we started farming in 1981. From that beginning, a quality 33 year relationship developed with the First Security Bank organization. The capital required for farming in general, and cattle feeding specifically, has increased tremendously. First Security has been a reliable and professional source of funding for our business and personal needs. First Security helped me start my farming career. Our business relationship gives me confidence in the future of our operation for me and my family. Having banked with First Security for 20 years, is was an obvious choice to partner with them on our expansion. In 2011, we saw a need to add two new service bays and lifts that allow us to serve vehicles as large as transit buses and motor homes. The First Security staff made our expansion dream a reality. You ‘AUTO’ give them a try! First Security Bank & Trust has been very supportive in the development of Red Cedar Lodge and all our banking needs. Without their partnership, Red Cedar Lodge would not be welcoming guests to Charles City from all over the world. First Security has been my bank of choice since we started our business. Our growth and success of our expansions have been a direct reflection of the quality and professional banking services we have received from First Security Bank & Trust. In 2001, with help from our bank in Thornton, we purchased an interest in the Thornton, Meservey, and Sheffield funeral homes. First Security partnered with us and continued to be instrumental helping Retz Funeral Home expand our business, which includes five towns and the surrounding area. We have a positive relationship with First Security, working to serve our communities together. We started in the farm equipment business in 1950. With the help of First Security Bank, we have been growing and able to meet the needs of our customers. We are looking forward to working for the next generation. First Security believed in our vision. With their trusted relationship we completed a new facility, allowing us to differentiate ourselves in the collision repair industry. Since creating Otto’s Oasis, First Security has been our business partner. 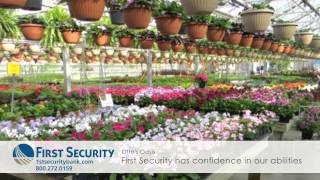 First Security has always had confidence in our abilities, and helped us grow.